Several memorandums in the field of trade, investment, and customs regulation were signed by representatives of China and the EU during the 20th China-EU Summit in Beijing on July 16, TASS reports. “Today we discussed in detail bilateral issues and agreed to oppose protectionism together,” said Premier of China’s State Council Li Keqiang. Donald Tusk, President of the European Council, and Jean-Claude Juncker, European Commission’s President, took part in signing of the related documents. 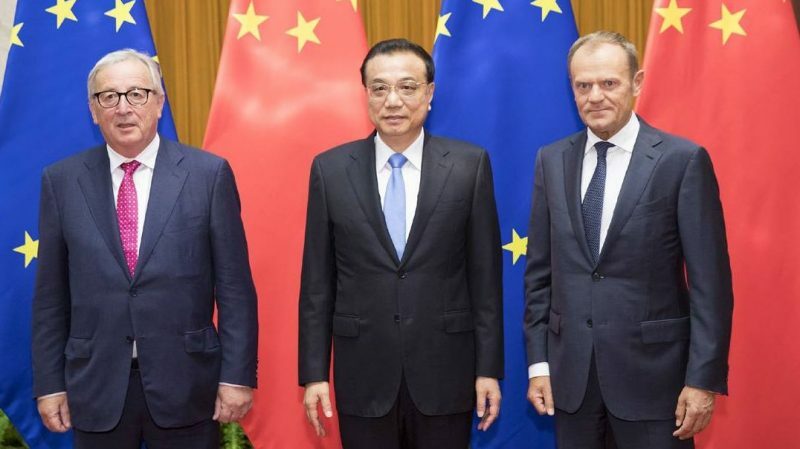 The 20th China-EU anniversary Summit was held in the Great Hall of the People in Beijing. The previous summit took place in 2017 in Belgium. The summit panels discuss trade, investment, and joint coordination in response to major international challenges. For instance, the 2017 summit was devoted to the issue of compliance with the Paris Agreement on climate change and maintaining peace on the Korean peninsula. This entry was posted in News from the Far East and tagged China, Economical War, The EU. Bookmark the permalink.